Which Potterhead isn´t waiting impatiently since its 11th birthday for a letter from Hogwarts and still believes in a confused owl that didn´t find the right way to his house yet? Wouldn´t you love to access platform 9 3/4 at the train station Kings Cross, ride the Hogwarts Express while admiring the beautiful landscape and be welcomed at the famous school of wizarding and witchcraft? ... It could be so amazing! Slowly I start believing that we have to keep waiting for this letter forever. But the dream of riding the Hogwarts Express can be fulfilled at any time. Thanks to Scotland and Discover Scotland Tours! Last week my dream finally came true and I could ride the Harry Potter train. Okay, maybe there was no sign saying Hogwarts Express but The Jacobite and the beautiful steam train did not leave from platform 9 3/4 in London but from the main station in Mallaig. Nevertheless, the train ride was really magical and a marvellous experience, not only recommendable for Harry Potter fans! But let´s start at the beginning. For 2018 I have decided to visit as many European cities as possible. After travelling to Porto in January, I booked a trip to Glasgow and Edinburgh in April. To also get to know the Scottish Highlands, I searched for a day trip starting in Glasgow. During my research on the internet I found Discover Scotland Tours. 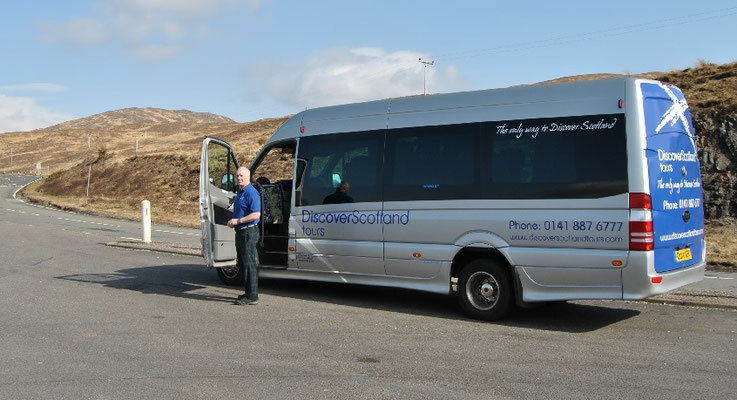 This tour provider offers 5 different day tours from Glasgow to the North of Scotland. 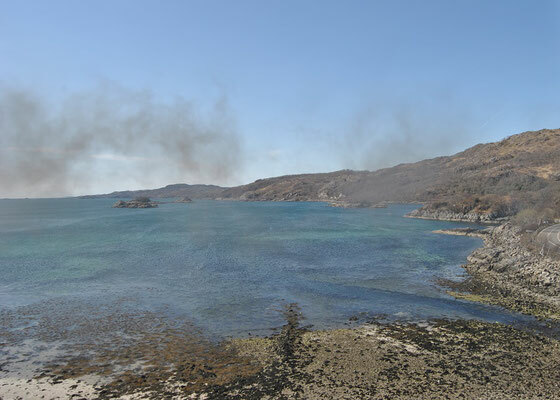 My eyes fell directly on the tour Glenfinnan, Mallaig & Jacobite Steam Train, because already the preview image of this tour made my heart beat faster. 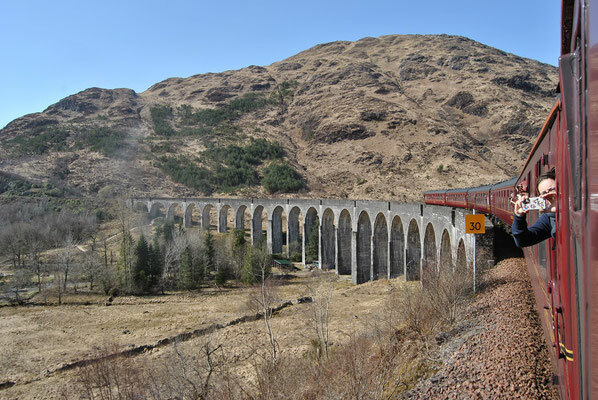 It showed the Jacobite Steam Train crossing the Glenfinnan-Viaduct or in my eyes the Hogwarts Express crossing the Harry Potter Bridge on its way to Hogwarts. Also the rest of the tour sounded great, not only because other Harry Potter film locations were part of it. Thus it was clear, I have to book this tour! 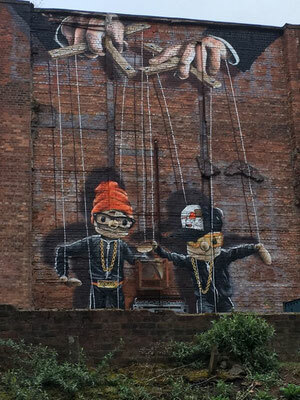 Last Thursday at 8 am the day tour started in Glasgow (266 George Street). 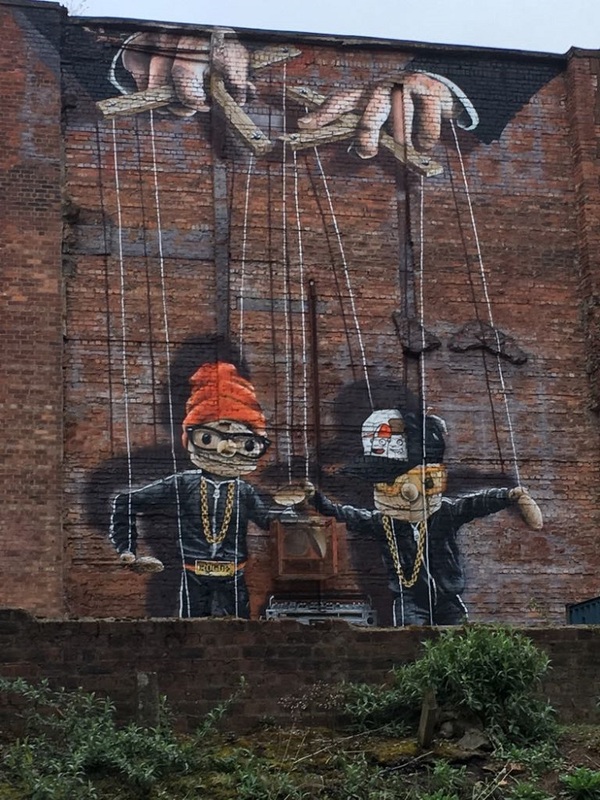 If you see the following graffiti and the Discover Scotland Tours bus you know you are at the right place and you will ride the Harry Potter train in a few hours. With a small group of 15 people and our guide Stuart we drove in a Mercedes Van to the North. Shortly after leaving Glasgow, we saw the first highlight of the tour; Loch Lomond. 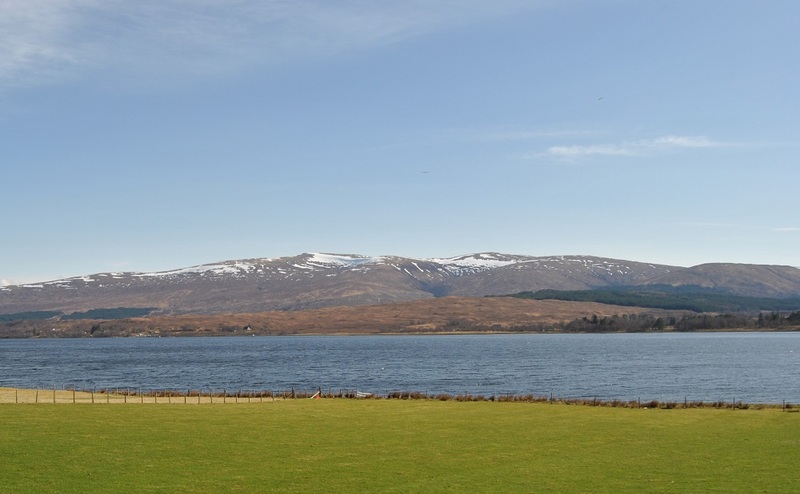 By the way: Loch is the Gaelic word for lake. 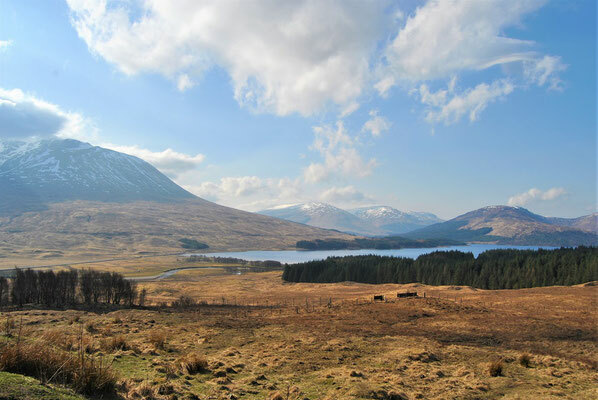 The largest lake in Scotland is 39 km long, up to 8 km wide and up to 190 meters deep. (For comparison: Loch Ness, which is a lot more famous, is 37 km long and only 2.7 km wide.) We followed the full length of Loch Lomond and could enjoy an amazing view at this huge lake for almost 45 minutes while listening to some Scottish music. Amongst others we heard the song "Loch Lomond". 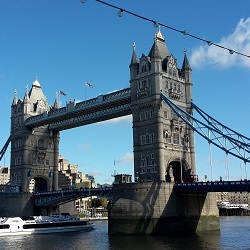 If you are a fan of the city Cologne, German carnival or football, you may know this melody because a German band named Höhner used it for their hymn "Mer stonn zo dir FC Kölle" (an anthem for the German football club FC Köln). The first stop of our day trip (after approx. 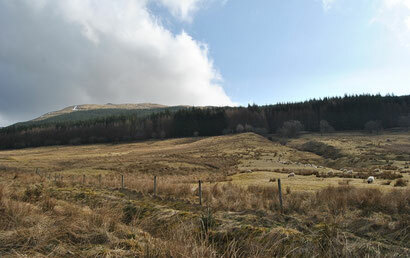 1.5 hours) was a small Scottish town named Tyndrum. We stopped there for a small coffee break. There is not a lot to see in this town. Therefore, we just grabbed a coffee to go and quickly continued our journey through the picturesque landscape of the Scottish Highlands. We passed green meadows and high snow covered mountains until we arrived in Glencoe. In Glencoe we made two photo stops and had the first magical moment of the day. I think Harry Potter fans will recognize the scenery. While filming the Harry Potter movies, Hagrid´s Hut and a small piece of the Hogwarts Bridge were set up in Glencoe. Unfortunately we didn´t stop directly at the former filming locations. 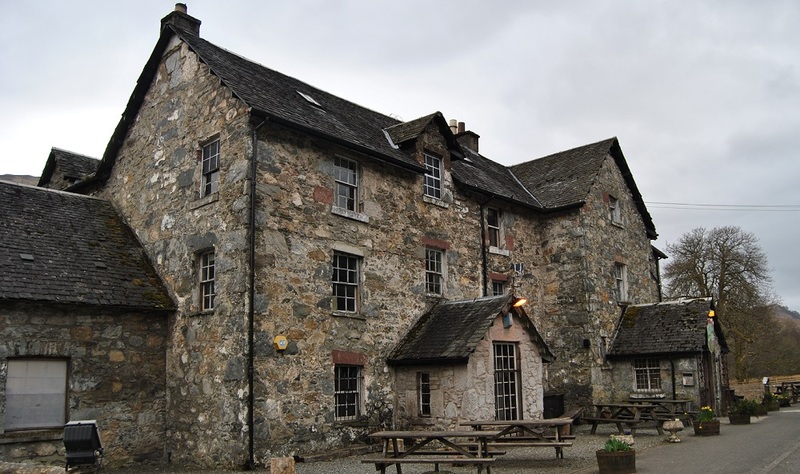 (For all who travel on their own by car: both film sets were built close to the pub Clachaig Inn; address: Ballachulish PH49 4HX.) Nevertheless stopping there was amazing due to the breath-taking landscape. 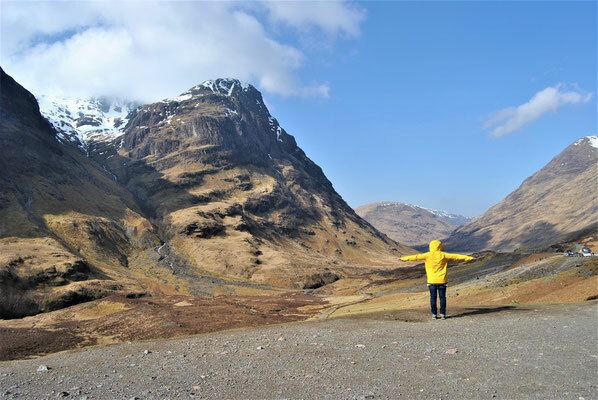 But the Glencoe Valley is not only famous because of the Harry Potter movies, it also has a tragically history. In 1692 a brutal massacre took place there and approx. 80 people lost their lives. The cause of the Massacre of Glencoe was an oath of allegiance to King Wilhelm III. of Oranien (successor of King James II. of England, who was deposed and replaced in the Glorious Revolution). The MacDonald’s Highland Clan took the oath a few days too late. Thus the king commanded to kill the whole clan. 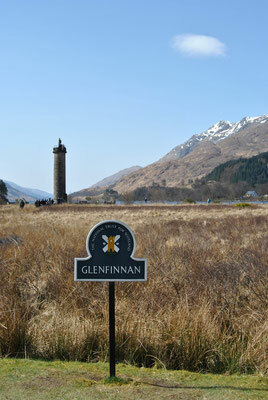 Then we drove to the next Harry Potter film set, Glenfinnan. The main tourist attraction there is the Glenfinnan Viaduct or the Harry Potter Bridge, a beautiful railway bridge from the 19. Century. The viaduct is 380 meters long and it used to be a real construction wonder out of concrete. 21 up to 30 meters high arched pillars can be seen from the viewpoint. Approx. 100 years after the opening the bridge became famous world-wide due to the Harry Potter movies. In these movies the Hogwarts Express crosses the bridge at the beginning of each school year to bring the students to school. In real life it is of course not the Harry Potter train but the Jacobite Steam Train that passes this viaduct on its way from Mallaig to Fort Williams. 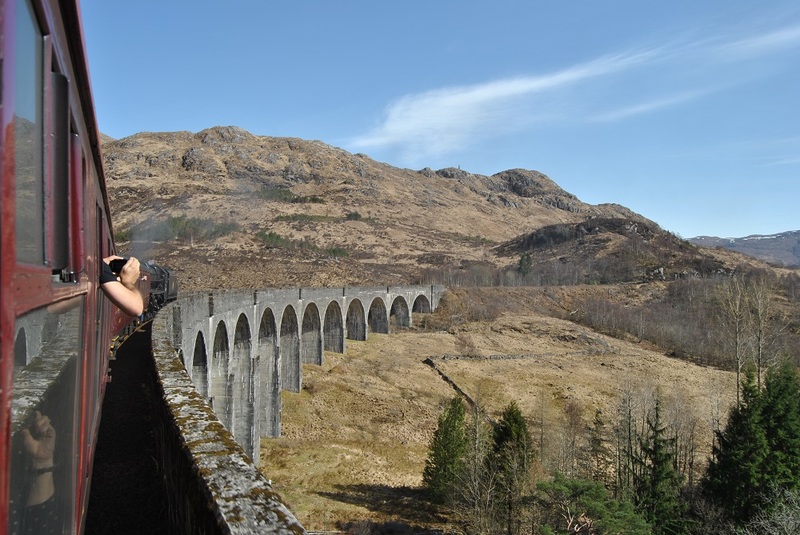 When seeing the Harry Potter Bridge in Glenfinnan, I couldn´t wait for riding the train myself. Another tourist attraction in Glenfinnan is the Glenfinnan Monument. It marks the place where Bonnie Prince Charlie, how the Scottish call him, raised his standard in 1745. Before that time he lived in France in exile like his father and grandfather, King James II. of England, who had to flee there in 1689. Bonnie Prince Charlie felt deprived of the throne. Therefore, he wanted to regain the kingdom with the Jacobins (how the followers of his grandfather were called). With its troops he could quickly capture different cities in Scotland and England. Before he wanted to make his final move by capturing London, he and the Jacobins went back to Scotland to gather new strengths. But back in Scotland they were defeated in April 1746 in a bloody battle. Afterwards, the prince fled back to France and most of his followers were killed. 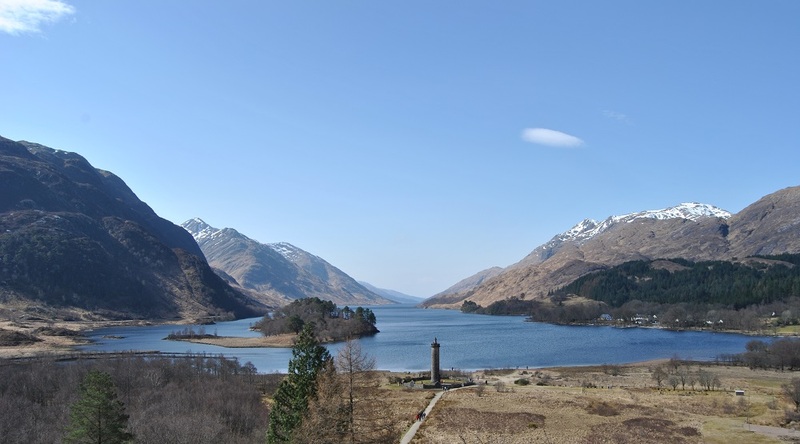 The monument is located at Loch Shiel, the seventh largest lake in Scotland. It is framed by some high mountains and offers a picturesque setting. Not surprising that Loch Shiel was used for some Harry Potter movie scenes. For example you can see this Loch in Harry Potter and the half-blood prince when Harry and Hermine look at the Hogwarts Lake from the astronomy tower. After a break of 30 minutes the tour continued. We passed by some other Lochs like Loch Eilt. Also this Scottish lake was used as a Harry Potter film set; for example for Harry Potter and the prisoner of Askaban. After Buckbeak was sentenced to death, Hagrid stood in the water of Loch Eilt or the Hogwarts Lake skipping some stones out over the water. After 30 minutes we arrived at the popular coastline Silver Sands. 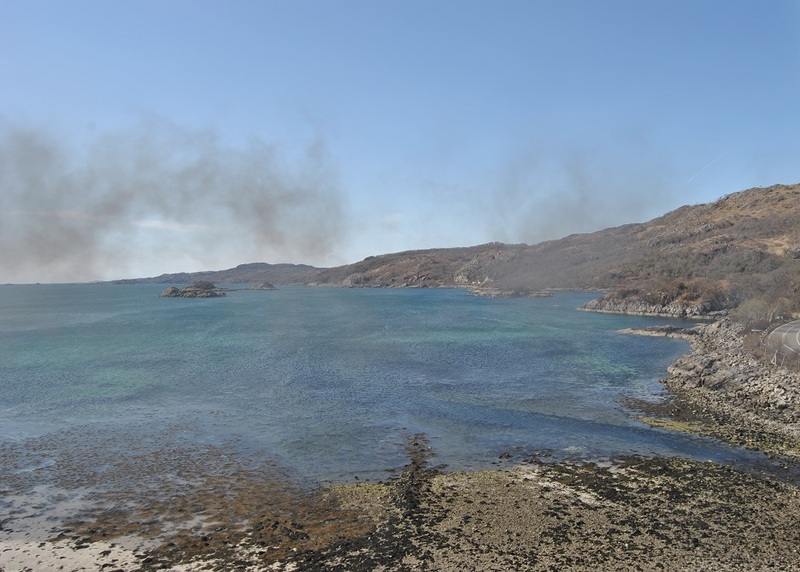 It is located in Morar, a Scottish village. When sunlight falls on the fine sand, it shines silver. This is why the beach is called Silver Sands. I couldn´t believe that Scotland has such beautiful beaches. 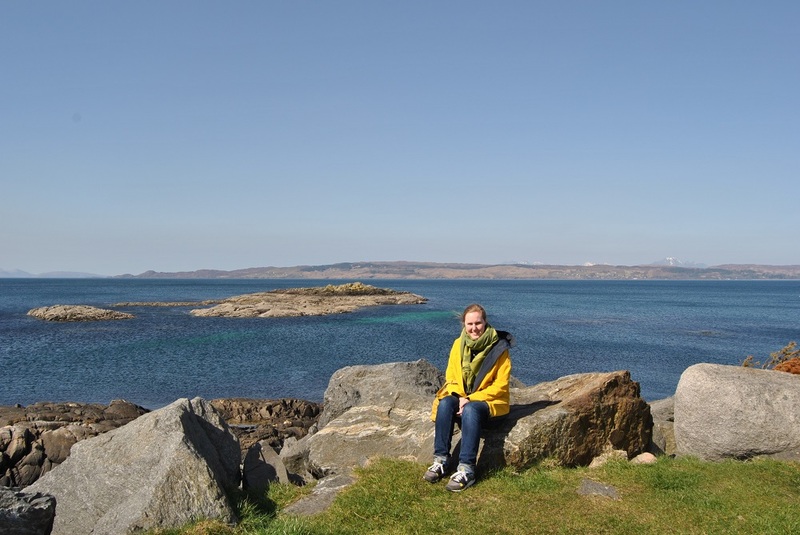 Then we made our way to Mallaig, a small town which is quite popular with tourists. We had one hour to discover the area and to have lunch. As a true Harry Potter fan you should not miss the Harry Potter shop Haggard Alley. 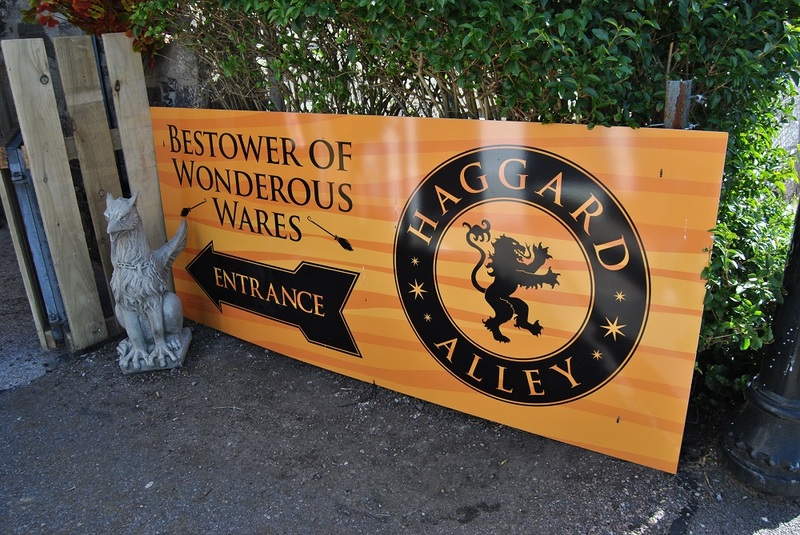 A small, bit hidden shop which offers many Harry Potter souvenirs. 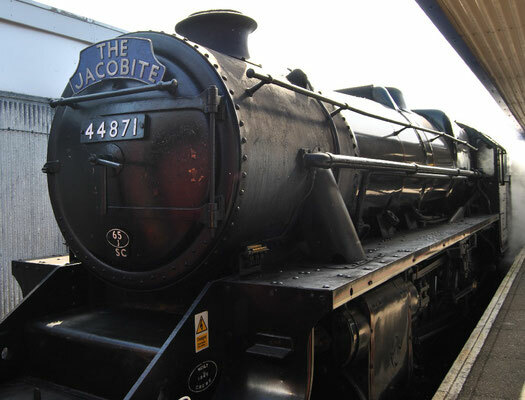 Now it was time for the highlight of the tour, a journey with the Harry Potter Train or the Jacobite Steam Train. Already when accessing the platform, feelings of happiness aroused in me. 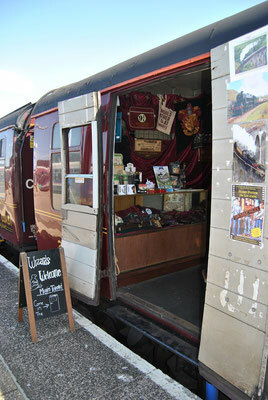 There it was the black and red steam train, which looks like the Hogwarts Express. The train ticket for a 2nd class ticket is included in the tour price. If you want a first class ticket, you can ask Discover Scotland Tours for an upgrade. We sat in the 2nd class and were totally fine with it. Almost two hours we drove through the beautiful Scottish Highlands. The landscape is just breath-taking. Although we drove a similar way to Mallaig by car, it was amazing to see the great scenery again from another perspective and even closer. 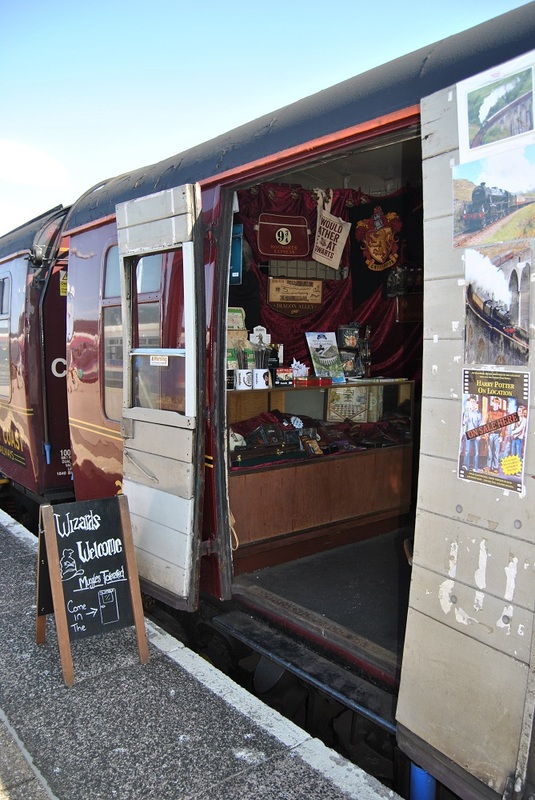 If you get bored during the train ride, which I actually can´t imagine, you can visit the Harry Potter shop in the train or get a coffee for example. After approx. 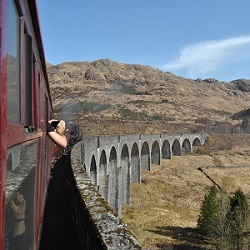 one hour the Harry Potter train stopped at the station in Glenfinnan. This is the sign for you to get your camera ready because shortly after, we crossed the Glenfinnan Viaduct. To get a perfect shot from the Harry Potter Bridge you should sit on the right side of the train next to a window. I would suggest asking Discover Scotland Tours if that is possible. If you don´t have a seat on the right (like me), you can stand next to a door. But stand up early because you won´t be the only one with this plan. After approx. 2 hours we left the Harry Potter train in Fort Williams. Unfortunately, there was no Hogwarts and no boats or coaches which could bring us to school of witchcraft and wizardry. 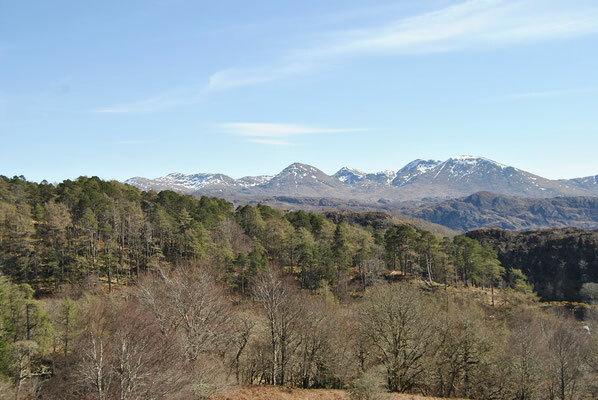 What we could see was the highest mountain of Great Britain. The Ben Nevis is 1345 meters high and dominates the landscape in Fort Williams significantly. Directly at the exit of the train station our guide Stuart was waiting for us to bring us back to Glasgow. 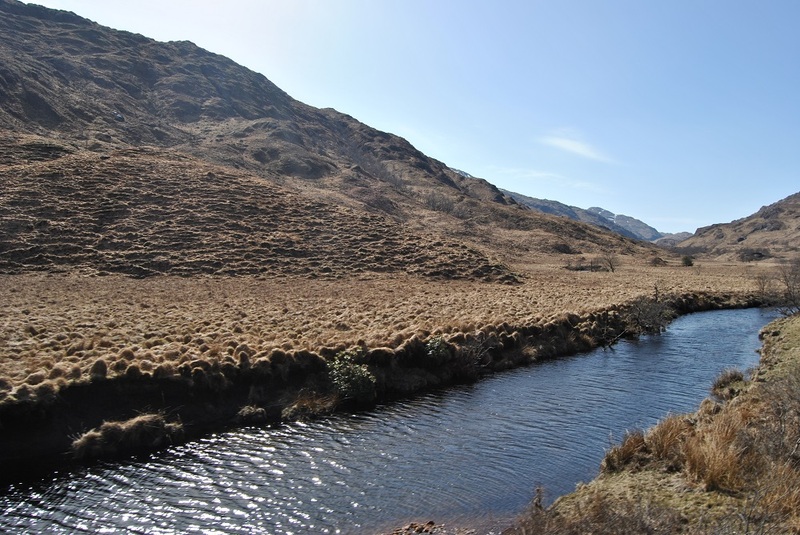 Of course during our return journey we could admire the breath-taking scenery again; high mountains, green meadows with Highland cows and sheep, lakes, rivers and waterfalls as well as the Rannoch Moor, a huge moor in the Scottish Highlands which is approx. 130 km². 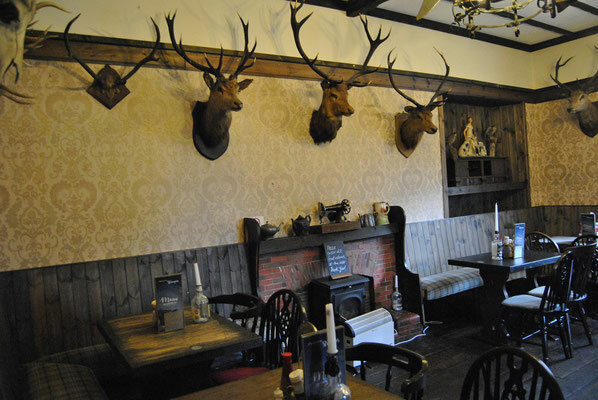 The last stop of our day trip through the Scottish Highlands was the guest house The Drovers Inn. But be careful, it is haunted! There are different horror stories about it. For example, some visitors say that they made photos from themselves there and after the photos were developed, a strange woman was in the picture who hasn´t been there when the photo was shot. Moreover, a young girl died in the river close to the pub. After the parents found her in the ice-cold water, they brought her to room number 6 and called a doctor. But unfortunately the doctor couldn´t help because the girl was already dead. Later some guests who spend a night in room number 6 said that they woke up in the middle of the night and the room was ice-cold and the bed completely wet. Today room number 6 is the most popular one. From Drovers Inn we drove back to Glasgow along Loch Lomond. After approx. one hour we arrived at George Street where our magical Discover Scotland journey ended. I absolutely enjoyed this tour from beginning to end. The train ride with the real Hogwarts Express, especially when crossing the Harry Potter Bridge, was my highlight of course. But also all the other stops were amazing as well. 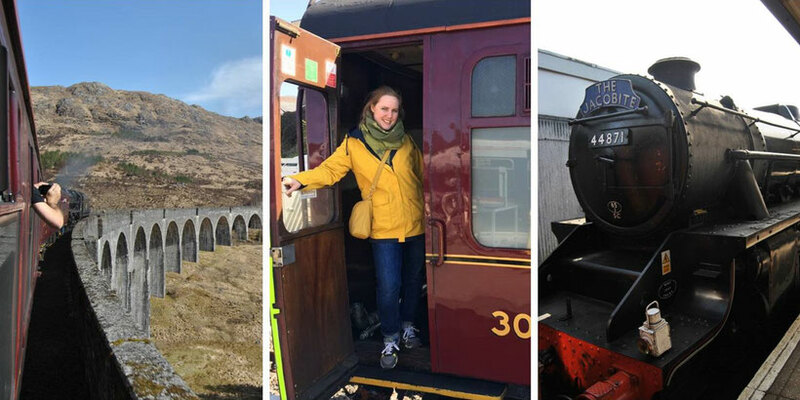 As a huge Harry Potter fan it was a great experience to visit all these filming locations but I think the tour is also unforgettable for Non-Potterheads due to the breath-taking landscape of the Scottish Highlands and the train ride with the Jacobite Steam Train. Furthermore, it was great to get to know so much about the Scottish history. Therefore, I would like to take the chance to thank our guide Stuart, who told us so much about the past of the whole kingdom and also showed us some Scottish music. Info: My husband and I were invited by Discover Scotland Tours to this day trip. This does NOT affect this review at all. 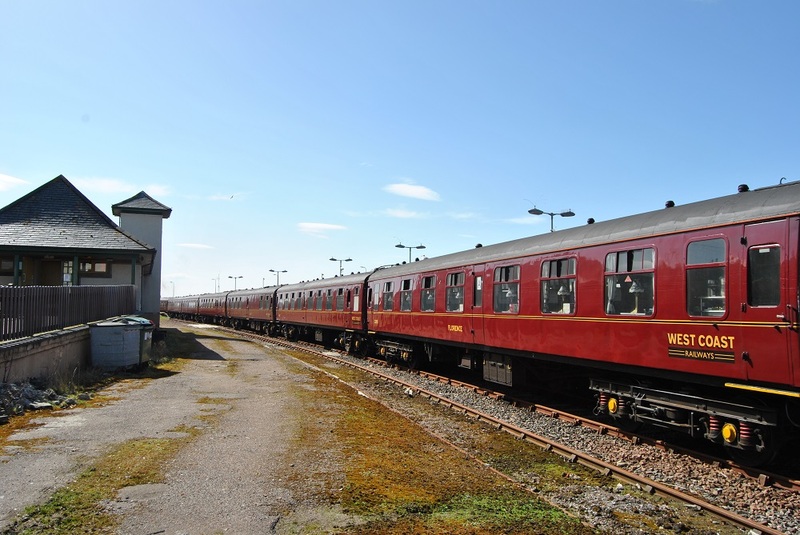 Book your Discover Scotland Tour including a ride with the real Hogwarts Express here! 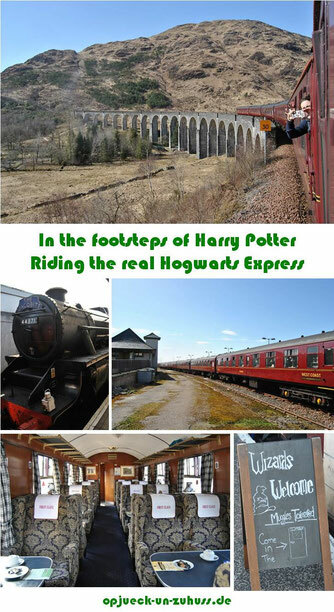 Have you ever visited some Harry Potter filming locations in Scotland or did you ride the real Hogwarts Express? Then leave a comment and tell me how you liked the journey with the Harry Potter train / the Jacobite Steam Train or the Highlands in Scotland. We so wanted to ride the Jacobite Steam Train while we were in Scotland, but we ran out of time! Would have loved to have been able to visit all of these film locations as well. I didn't realize there were so many in Scotland! Omg, my bestfriend is going to flip once I share this to her. I have not read Harry Potter nor watched the movies but you experience is something that i would like to experience in the future, too! So awesome! Wooooooooow I'm very very jealous. Taking note of all of this as I will definitely do it at some point♥ Thanks for sharing! I had to send this post to my husband. It is right up his alley and sounds so fun! Wow! It sound a like you’re on an epic journey-as many Europeancities as possible! I would love to do that. Glad you were able to make your Harry Potter dream come true. It sounds fabulous! 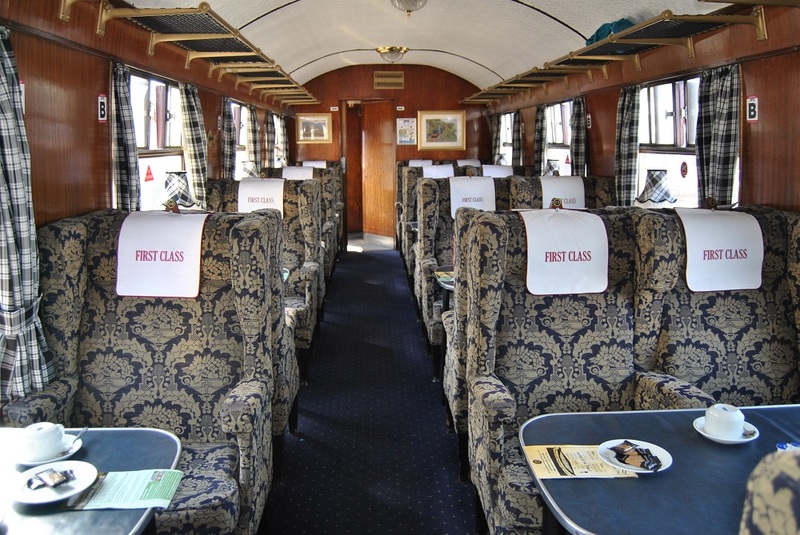 Oh how I would have loved to take my children on this train when they were younger. 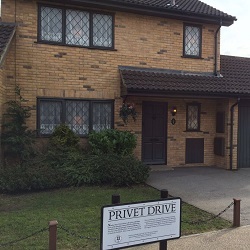 What fun to do a Harry Potter tour. I'm also a huge fan Harry Potter so this tour sounds just amazing ! I should admit I'm very very jealous as I would definitively love to relive some of the films' most iconic scenes with an itinerary of Harry Potter sites in Scotland. Thank you for sharing this incredible experience ! 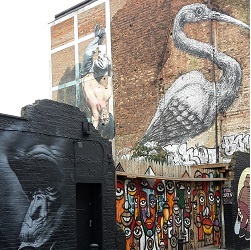 I am the owner of Haggard Alley and I just want to say thank you for including us in your blog !